We need to talk about these 4 amazing women-developers. We can all agree that career shifts are a bit scary; venturing into completely new territory feels challenging and exciting, and at times more than a little bit intimidating. That’s not to say that it can’t be done successfully, especially with guidance and training from the right people. Meet our Internship stars, now the main characters of an ongoing client story. 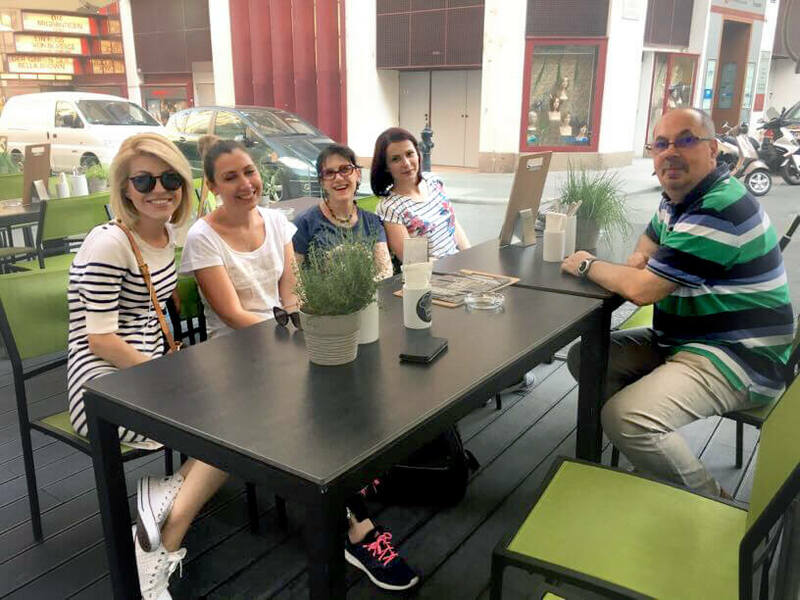 In the snapshot above, Sandra, Ana Ioana, Alexandra, Mona, and Mihai are enjoying some well-earned r&r at a restaurant near the client site, where the ladies are currently working on their first client-project. The ladies all come from non-tech backgrounds – they had all been working in completely unrelated fields until about 6 months ago. They applied to an InCrys COBOL Internship, looking to completely reinvent their careers – and they’ve exceeded their own expectations. We’re so proud that they’re now part of InCrys as full-time developers! The internship lasted from March to May, during which time the trainees went from zero COBOL awareness, to full working proficiency as junior developers. Showing dedication throughout the more challenging times and contagious enthusiasm all around, these 4 amazing women have taken charge of their careers and turned them around completely. Currently part of a project for the Financial Industry, the young women-developers tell a story of determination and passion, a story we’re honored to have had a formative role in. With Mihai as the voice of experience in the group, the team is perfectly balanced for the project at hand; his enthusiasm and guidance are helping to make this story a client success. We’re glad you’re all a part of the InCrys family! If you’d like to know more about the Internship programs we’re planning or our open positions, stay in touch with us through Facebook!